We can help you select the color and design of your new bath as well as install the finished product. If you are building a new residence or renovating your existing home, our employees have the experience and knowledge to get the job done. Our showroom presents many of the colors available to help complete your decorating scheme. Whether you select from our standard, high fashion, onyx, granite (cultured) or solid gel coat colors, you can be assured the finished product will be beautiful. Need help with the design of your new bath? We will be glad to meet you on site or provide you with design consultation in our showroom. Our installation crew members are full time employees of Venetian Marble, Inc. By employing our own crews, we are able to ensure that the highest quality installation materials and workmanship are provided to our customers. 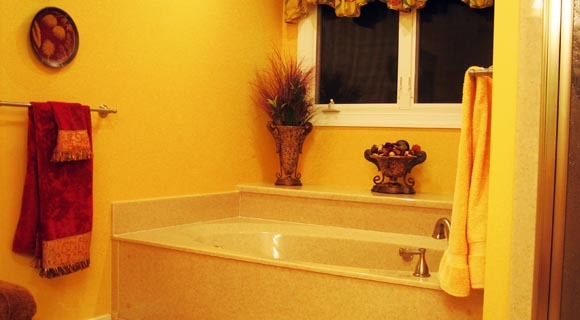 Finally, as a Class A Contractor, we can provide all of the services necessary to remodel your bathroom. Whether you need a turn key job or just a little help, we will be glad to assist you.